It's Facebook Fridays! for May 9, 2014! This is the week for you to get a job, keep your job, or get better hours on the job. 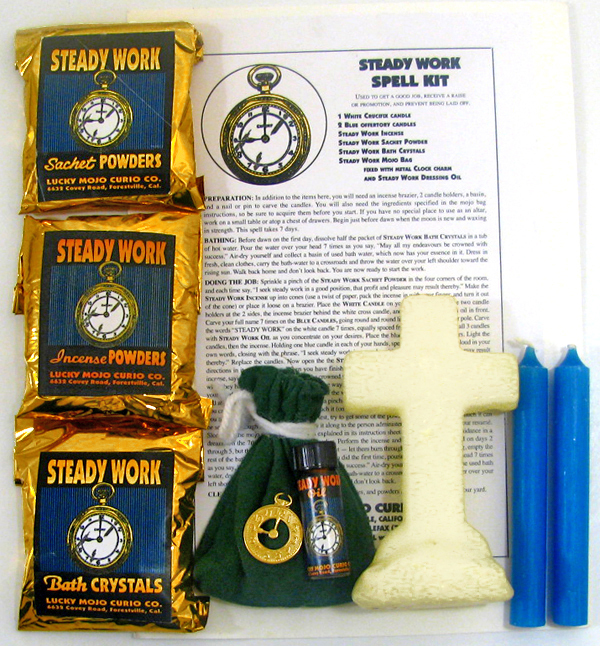 The Lucky Mojo Curio Co. is hosting a random drawing to give away 3 big Steady Work spiritual supply prizes for a good job in a happy workplace! 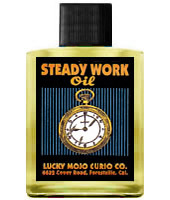 This week the prizes are a Steady Work Spell Kit complete with all ingredients and full instructions, or an authentic Lucky Mojo Steady Work Mojo Hand, or a bottle of our Steady Work Dressing Oil. First thing tomorrow morning, we will select THREE winners at random, announce their names here, contact them via Facebook to get their mailing addresses, and send them their FREE Steady Work products. Thank you for posting this, Ernie! We have a winner! In fact, we have three lucky winners! Our Facebook Fridays Giveaway winners for May 9, 2014 are: Katie Landers, Jay Reynolds, and Nelle White.